Please note that there'll be several posts about my vacation in Hawaii. I'm in the midst of settling into my usual routine because when you go out-of-town for two weeks - things do pile up. I finally renewed my driver's license today, so that's a relief. I still have to pick-up my mail at the Post Office, as I've put a two week stop of mail delivery. I can't wait to sift through my mail. My flight left at 7 AM on December 23. I wasn't looking forward to the long flight and two stopovers (Phoenix and Kona), but my heart swelled up with the thought of being with family and being at home. On my flight from Phoenix to Kona, the girl who sat beside me happens to be a Filipina local (meaning she's Filipino but born in Kona). We ended up talking about how we missed Hawaii, the Filipino culture transplanted in the islands, and about our favorite local plates. Our conversation made the 5 hour flight bearable and the next thing I knew, we landed at the Kona airport. She was glad to be home, but I had to catch a short flight to Honolulu. We exchanged e-mails and promised to keep-in-touch. It was 70 degrees and humid in Kona. It was funny because I was sweating, was still wearing a jacket and hauling a thick coat. This was the fourth time I've been on the island. The first was for work and the other two were for vacation. This was the first time for a stopover. Since it's an open airport, I sat near a garden, closed my eyes and simply let the humidity engulf me. Soon, I'll be home. My plane landed at the Honolulu airport late in the afternoon. My parents were already at the arrival area with big smiles; I knew I was home. 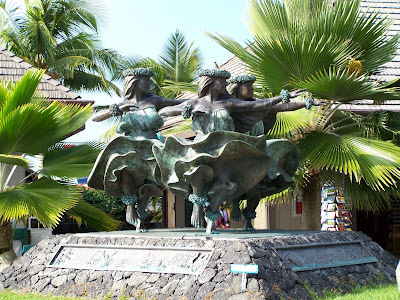 The photo below was taken at the Kona airport. Once I got out of the airport, Mom asked me what I wanted to eat. I instantly replied, "Chicken Katsu at L&B." 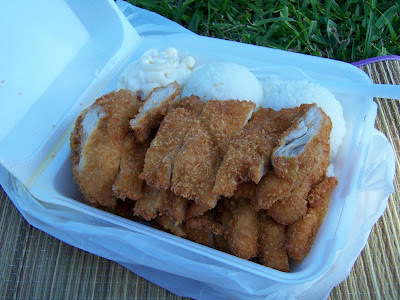 I've been dreaming of this crispy chicken dipped in delicious sauce on a plate of steaming rice with the local macaroni salad on the side. I devoured this plate. Nothing beats the taste of home. It was a busy and crazy day. There were lots of presents to wrap. The cousins were busy doing last minute shopping. Sales were ongoing. Mom and Grandma were making noise in the kitchen. When Christmas morning arrived, colorful Christmas wrappings were torn and scattered. There was constant eating, and Grandma just kept on cooking. In the afternoon, my parents and I managed to go for a walk at the beach. This photo was taken at Ewa Beach on Christmas Day. I think that boy was taking a siesta. Wouldn't it be nice to be able to do that every day? The next day, O'ahu got a lightning storm, and boy, the island lost power and was left in the dark for hours. 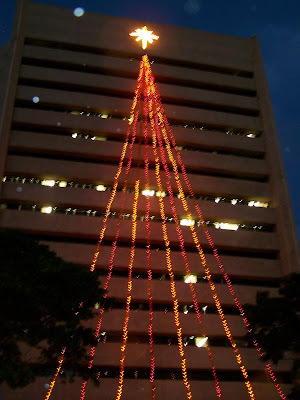 The island felt quiet and torches were lighted in Waikiki - just like the old days. It was relaxing to be rid of lights and noise, but I was concerned about the Obama Family who were also vacationing in O'ahu at that time. My parents and I had a relaxing time visiting the Christmas Exhibit at the Honolulu Hale and the Honolulu City Lights. Here are a few photos I took. There were a lot of Christmas Trees in the exhibit, but this one looks delish - Pastry Christmas Tree. I thought this was really cute. 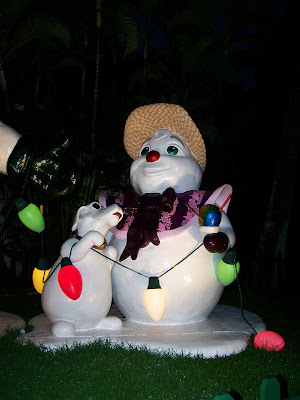 Part of the Snowman Family exhibit. Introducing Mr. and Mrs. Santa! 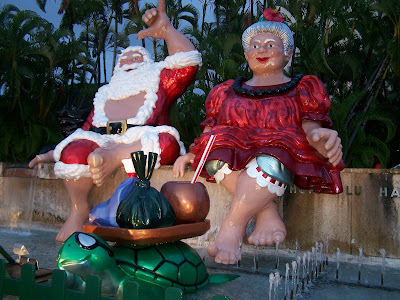 Mr. Santa doing the shaka sign, and Mrs. Santa wearing a muu-muu. In front of them is the Turtle carrying a tray featuring Hawaiian delicacies such as laulau (wrapped in luau leaf or commonly known as taro), poi (another food made of taro), and a coconut drink with straw. I love laulau. 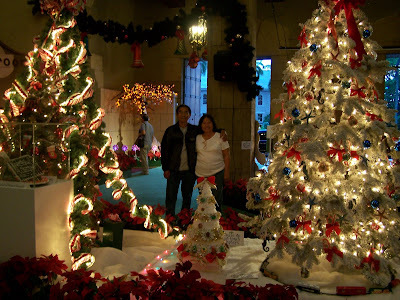 Mom and Dad enjoying the Christmas Tree exhibit at the Honolulu Hale. String of lights - follow the star. 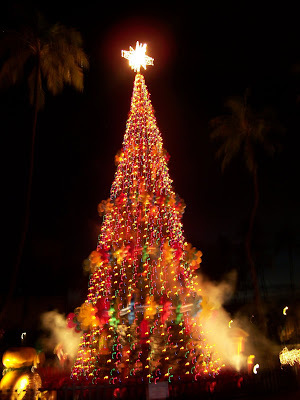 The biggest Christmas Tree in the island of O'ahu, complete with train steam effects. those pictures are simply breathtaking. The picture of the beach with the coconut trees is so "Filipino" also, don't you think? Parang Philippines din ano? Kg, I agree, Hawaii is very similar to our country. You'd see Filipinos everywhere. Also, Tagalog and Ilocano are used all the time. oh how I wish I could be that boy under the coconut tree ;) what a nice way to enjoy Christmas ;) I wish I could be somewhere with coconut/palm trees now, especially in this -13 celsius weather we are having at the moment. love the pictures ;) thanks for sharing it with us. 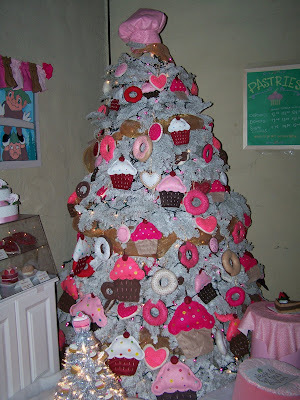 love the candy/pastry christmas tree . Cheryle, I do love that pastry tree too. I love donuts =). Wits, Yes, I had a wonderful time. I can't wait to see your photos too. Toni, The boy under the Coconut tree really looks relaxed. He slept there the whole afternoon. i want to have one of those Christmas trees! I'm glad you had a nice vacation. 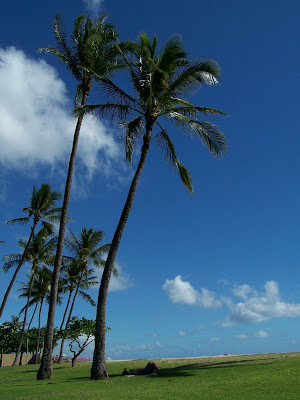 Is it ever possible not to enjoy in Hawaii? hehe. mordsith, for me, i've lived in hawaii and there are so many things i still want to do. also, there are other islands you can also visit. Ohhh, very nice Christmas tree, i love the color, so pinkish, ganda! Sheng and Toni, Mahalo (Thank you).